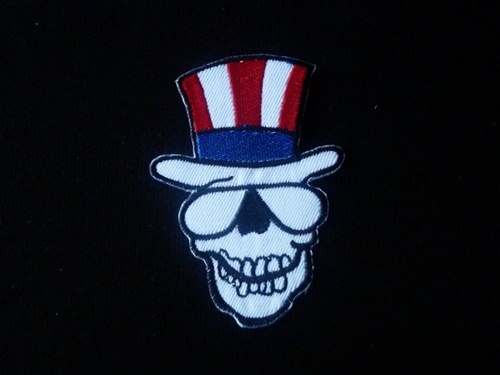 Red Hat Skull EMBROIDERY IRON ON PATCHES 50 pcs. EMBROIDERY IRON ON PATCHES PUNK 50 pcs. SKU: PK002. Categories: Punk Patches, Skull Patches. Tags: iron on patches, punk, hippie, Skull. Iron and apply firm pressure evenly on the patch for approx 30-40sec. Iron the opposite side for approx 20-30sec to reinforce. The patches have a variety of applications and can be put on shirts, jackets, bags, pants jeans and hats. The patches will iron onto most fabrics that can withstand the heat of a hot dry iron. Fabrics that may not be suitable include leather, rain wear (water-proof), highly elastic fabrics, or nylon fabrics. For materials such as these the patches can be stitched or glued. METALLICA HARD ROCK MUSIC BAND IRON ON PATCHES 50 pcs.